When spring arrives, everyone is so…..relieved, I guess is the best word. We all sigh and say to ourselves “finally!” So when we get a bit of colder weather again, not snow, just a bit chillier than we’ve been having, you don’t want to go back to eating wintertime dishes. But I do want something to warm me up. I found a spicy soup that fits the bill. It calls for shrimp, but any mild white fish will work. 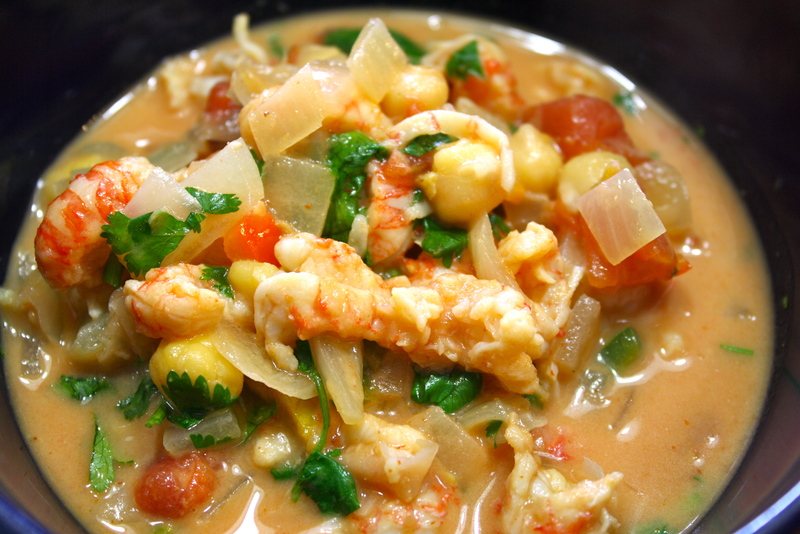 I happen to have some langostino tails in my freezer and used them. It also has jalapeno and Sriracha sauce to liven up the flavors. Add some coconut milk and lime juice and you’ll start thinking you’re very cosmopolitan! 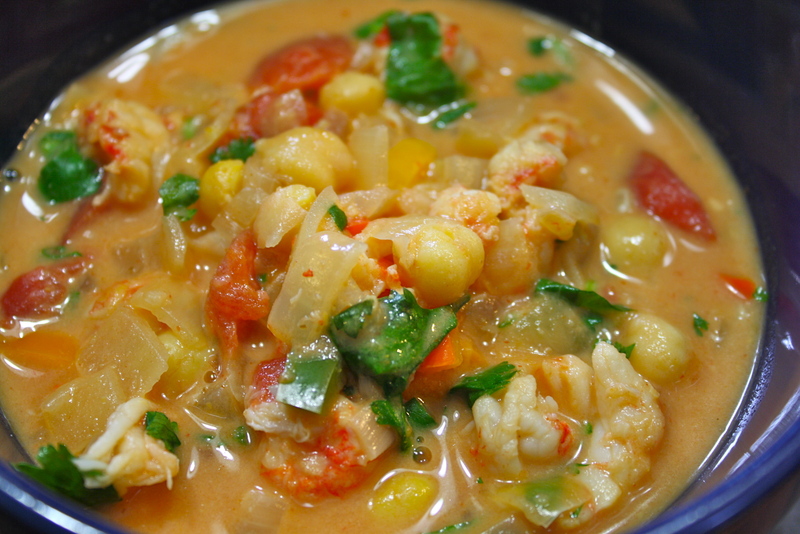 This soup is really fast, perfect for a work night meal. It is ready in 45 minutes. Great flavors, easy to make….a real Good Food Not Much Time success! My family loved it and we will be eating this one again. In a medium soup pan, saute onions in olive oil over medium heat until translucent. 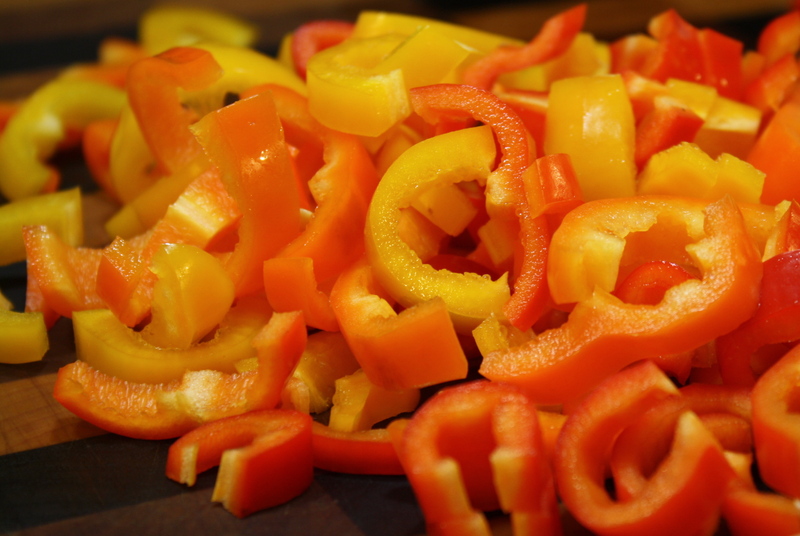 Add garlic, sweet peppers and jalapeno and saute for another 5 minutes or so. Add the coriander and garbonzo beans and allow to simmer for another 5 minutes. Add tomatoes and shrimp to the pan and simmer gently until the shrimp turns opaque. Add all the coconut milk and Sriracha sauce, and cook just until heated through – do not boil! Add lime juice and season with salt and pepper to taste. 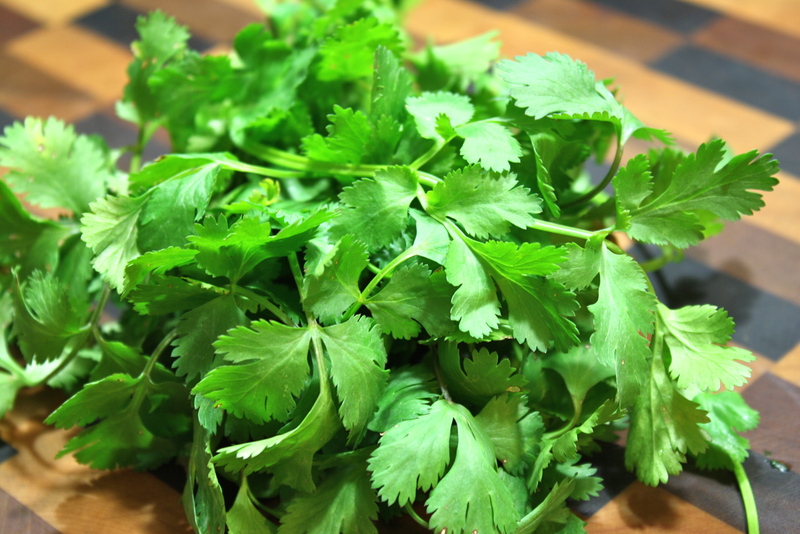 Toss in the fresh cilantro. Stir and serve immediately. My husband says this is great with a good IPA! Enjoy! damn girl, THAT looks good… ……………………………………………………… Lord, keep Your arm around my shoulder and Your hand over my mouth!